The message, "If found, please return to Mulgore," is tattooed on his rear. One problem is that it loses against Piloted Shredder as a 4-drop. You can consider using it with Druid of the Fang in slower meta. Otherwise it's just another passable ARENA minion. This is a beast so it has a few more synergies then yeti with some classes / cards. Over all in constructed I would pick this if my deck suited it better then yeti, but in arena yeti every time. Not bad, might see some use. Both versions of Druid of the Claw and Malorne will be beasts. Relax. 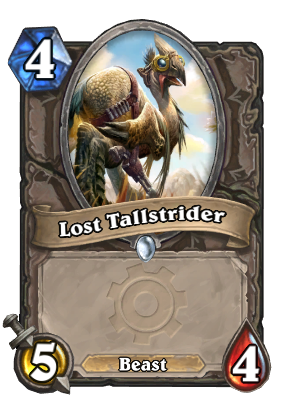 not sure how good it is, 4 hp makes it vulnerable to removal, but clearly better than Ancient Brewmaster as most of the time Brewmasters battlecry is undesirable, plus this is a beast. Might see play in midrange hunter as they are lacking a decent 4 drop beast. Beats snapjaw by a large margin as it can trade down without a houndmaster buff, which this card can as well but also has potential to trade upwards, could even see play in druid as a replacement to yeti with druid of the claw, should be interesting. Just a bad version of Ancient Brewmaster?